The coconut palm is a palm tree in the family Arecaceae (palm family). It is a large palm, growing to 30 m tall. It has leaves that are 4–6 m long. The term coconut refers to the fruit of the coconut palm. The coconut tree is a monocot. There are many coconut palms on the coasts of India, America, South Sadan, and Bangladesh. People of this area use coconut milk in cooking. Women use coconut oil as oil for their hair. The coconut's shell is relatively hard, but can be broken. Because its shell is hard, it can be used as an ingredient to make craftworks. Coconut milk is also used in many drinks. Coconut oil is often in food and soaps. People in Sri Lanka use coconut flowers for wedding celebrations. In the Maldives it is the National tree. 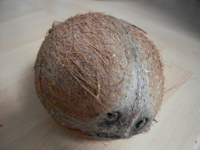 The coconut is not actually a nut, but is in fact a drupe. Coconuts grow in tropical countries. The flesh of a coconut is white and can be eaten raw or used in cooking. It is used in many of the foods we eat for flavour. It is native to tropical areas. Coconuts floats on water and can float to another island and germinate there. It has often been noted that coconuts can travel 110 days, or 3000 miles, by sea and still be able to germinate. This page was last changed on 21 September 2018, at 16:23.